U-Turn is a crossover steering design that eliminates steering toe change from suspension height change. The drag link connection at the passenger hub allows full turning radius lock to lock to match the steering box. 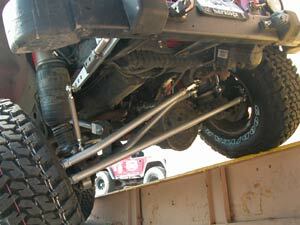 The drag link design allows clearance for track bar bracket/sway bar bracket. No bracket trimming is required after you lift your Jeep. Custom hubs that bolt to your original steering knuckles, machined and TIG welded for strength, tapered for tie rod end attachment. U-Turn requires a stock pitman arm to be installed. Designed for TJ's from 2" to 6" of lift. Stock height TJs may have a slight interference during maximum compression, not an issue during articulation. 15" wheels with more than 3.75" of backspacing may deliver an interference with the U-Turn Hubs, light grinding may allow fitment, wheel spacers to adjust backspacing optional. (NOTE: Off Road Only has tested U-Turn on XJ and ZJ models, and found it perform as well as TJ's, XJ's with the RE LA kit see significant improvement over stock inverted Y setup. However, not every lift combination has been tried with the XJ/ZJ platforms, please call and discuss your application before ordering!) Early U-Turn owners, look for the Generation 3 draglink upgrade in our store now to take advantage of the recent changes! The changes are in reference to the draglink. The tie rod ends now included in the U-Turn for the draglink are the same tie rod end that your Jeep had stock at the pitman arm. The integration of this joint delivers a wider range of misalignment for the drag link as well as a larger ball and socket design which delivers longer service life. This change also means that the stock TJ/ZJ/XJ pitman arm tie rod end may be retained for a spare, and replacement parts for this are more readily available at most auto parts stores.